An end is finally coming to speculation surrounding Khloe Kardashian’s paternity. 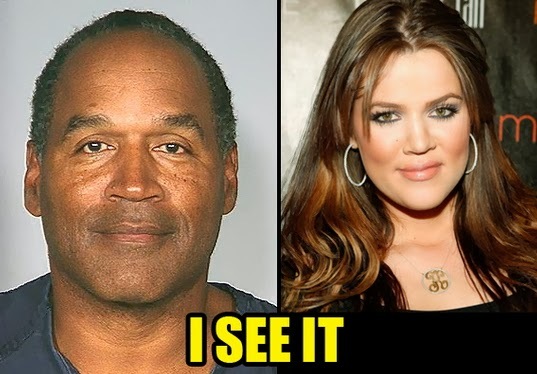 According to Norman Pardo, the manager of Ex-American footballer OJ Simpson, Khloe’s mother, Kris Jenner slept with OJ Simpson few years back. Norman said OJ is likely the real father of Khloe Kardashian. This was revealed in an exclusive interview with In Touch Magazine. Kardashian also served as a member of Simpson’s ‘Dream Team’ as his attorney in the famous 1995 murder trial. While Kris Jenner has openly admitted cheating on her former husband, she has always strongly denied any suggestion that Robert was not her daughter’s father. Take a closer look at the above picture, they share the same nose…. Isn’t it? Even they both smile the same way. Blood they say is thicker than water. Guess it is time for a quick DNA test. I agree.She’s very pretty.I like her. Peace.Love.Luis. Wetin come concern naija with paternity Abeg mek u post naija matter. Not only the smile but the genes,same perfil.She’s beautifull.Natural body.I like her. Peace.Love.Luis.